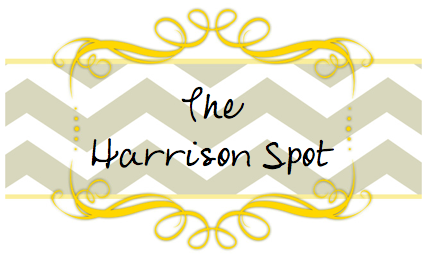 so, let's just say i forgot i had a blog. for over two years. i don't know how that happens. i guess life happened. i cracked up when i read my last post. i had just had kase two weeks before, now he is 2.5 years old. i also cannot believe how much life has changed for us in these short 2 years. let's just cut to now and what is going on now. it's summer, it has been an amazing summer at that. this picture below pretty much sums up what i have done all summer. 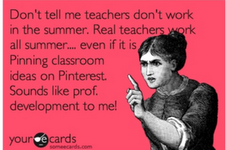 i have pinned and have tried to make a lot of the stuff i have pinned. i learned my new best friends are hot glue, hobby lobby and burlap. enjoy. yellow bulletin border. i tried to be as economical as possible when decorating for the new year. i saw another pinner do this. all it is, is butcher paper. you simply tear it into 3-4 inch strips. then accordion fold the paper. then scrunch the paper up. take one strip at a time. bunch a little and staple, bunch a little and staple. it was very simple and went quickly after i got the hang of it. all i did on this board was use a simple black and white dot border. then i went after the butcher paper cart again. i ripped it into strips, scrunched, twisted and stapled. again, very simple. my announcement center. all this is, is dollar store frames with cute scrapbook paper. they make perfectly cute dry erase boards. i love them! we redid kase's room this summer. he now has a big boy room. on this project, i went to my local hobby lobby and purchased: burlap, red twine, blue paint. second, i downloaded a boyish font for free from pinterest. 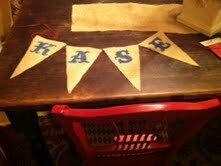 i printed out the letters for his name and laid them under the burlap. then i simply painted on top of the burlap. the paper shows through beneath making it very simple to paint. we have some very tall windows in our house. it's expensive to purchase curtains for tall windows. these curtains have been in our master bedroom since we moved in. for two years i have looked despised them. a couple of weeks ago i had a thought. why not add some fabric to the bottom???? duh. i don't sew though. i do however, iron and use iron on sewing tape. it took a half yard of fabric for each panel. all you do is lay the sew tape on the edges and then pin the hems. then iron over the hems until the tape has melted and the hems are ironed together. 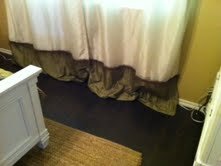 i also purchased some fringe and fabric glued it on to cover where the curtains meet. i liked it so much i did it to several other curtains too. i am very proud of this one. i saw one similar to this on pinterest, but hers was much shorter. i took a little trip to my local home depot and found a guy that thought i had no clue what i was doing to cut wood for me. i asked him for a 4x4 and a 2x6. I had him cut the the 4x4 in half and then had him cut 4 pieces of 2x6 off. i cut two pieces of 2x6 an inch shorter on two sides with the jigsaw at home. then i stacked the small pieces and the post together and screwed them together. i repeated on the other side. on the top i drilled a hole and screwed in the finial, just for a little extra pizzaz and height. i then used a spray paint primer on it. sprayed the edges with heirloom colored paint. then i sprayed it all black. i went back over the edges with a little sand paper so the heirloom would show through. lastly, i screwed on an oil rubbed bronze hook to hold the sign. i purchased the wooden sign at hobby lobby and used the same spray paint from the post. i sprayed it randomly with the black and went pack over it lightly with the heirloom. it has a really cool aged look. the letters were cut out of vinyl on the cricut. i know i am dragging this out. i'll hurry up. i wanted to make a wreath for school out of pencils and left hobby lobby with the materials to make this. this was simply a grapevine wreath, a small chalkboard, burlap and canvas flowers, red crochet flowers and turquoise paint. i used my magical hot glue gun and quickly put this together. i love it. it will look so cute outside my door. 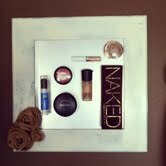 lastly, i made this cute board to hang in my bathroom. again, i went to my favorite store, hobby lobby. i bought a piece of scrap metal, an unpainted 12x12 frame, magnets and burlap. i spray painted the sign with leftover paint from the post. i used the same aging technique that i did on the welcome sign above. i cut the metal to fit the frame and then stuck magnets on my makeup. i suggest getting strong magnets for sure though. however, this cleared up a drawer in my bathroom. i thought it needed some more character, so i made the burlap rosettes. google how to do that. very simple again. i used the leftover burlap as a table runner.